Figure 3.25. Size-determining parameter group correlates with Kiichemann's tau. values of tau less than 0.24, and one for values greater than 0.24. The shaded rectangle represents typical SSTO solution space for both rocket and airbreathing propulsion systems. The reason the solution space is so narrow is that, whatever the propulsion system, the quantity of hydrogen fuel is approximately the same, and therefore the volumes for the different propulsion systems are quite similar. With liquid oxygen 15.2 time more dense than liquid hydrogen, the presence or absence of liquid oxygen has a significant weight impact, but a lesser volume impact. The Kv term is a function of tau and the configuration concept and details of this formulation can be found in [Curran and Murthy, 2000]. Nominally Kv has a value of 0.4 for a wide range of tau and configurations. 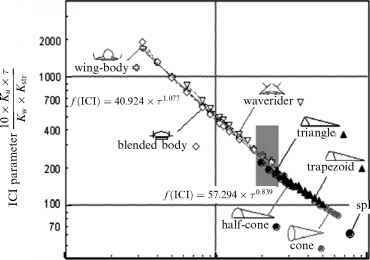 The Kv term is a correlation term that defines the maximum volume available for propellant as a function of vehicle size as defined by the planform area. The correlation is based on analyzing the results of hypersonic design studies from the author's experience that spans from 20 tons to 500 tons gross weight vehicles. Figure 3.26. All-rocket available design space is limited. time. 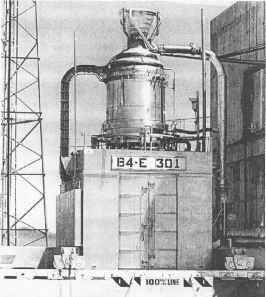 In 1968, the projected 1983 weight of an insulated, aluminum structure that is, both the structure and the propellant tank, was 3.5 lb/ft2 (17.1 kg/m2) [HyFac, 1970]. In 1993, NASA's estimated weight of an insulated, aluminum structure for a hypersonic waverider aircraft, that is, both the structure and the propellant tank, was 3.5 lb/ft2 (17.1 kg/m2) [Pegg and Hunt, 1993]. Using these values, the estimated range for the current value of ICI is 9 to 11. This then gives us a boundary to establish the practicality of SSTO vehicles with today's industrial capability. If the value ICI is 9 to 11 or less, the concept is practical in terms of current industrial capability. 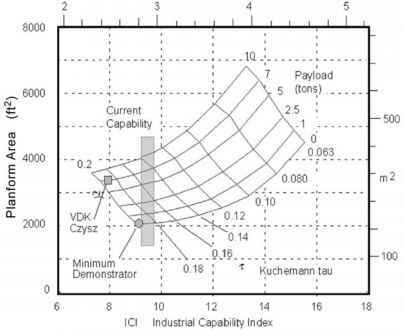 If the value of ICI of a configuration/propulsion system is greater than the boundary value, then it is doubtful the concept is practical in terms of the current industrial capability The distance the concept under consideration is from the ICI boundary is a measure of the margin, or lack of margin, with respect to the current state of the art, perhaps more meaningful than less quantitative indices such as the popular ''technology readiness level''. (1) All-rocket, topping cycle similar to the P&W XLR-129 or the US SSME. For hydrogen/oxygen propellants is a hypersonic glider analogous to FDL-7C/D, Figure 3.26. (2) Rocket plus ejector ram/scramjet operating as an airbreathing system to Mach number 8, then transitioning to rocket to orbit. For hydrogen/oxygen propellants, the airbreather configuration shown in Figure 3.27. (3) Rocket plus ejector ram/scramjet operating as an airbreathing system to Mach number 12 then transitioning to rocket to orbit. For hydrogen/oxygen propel-lants, the airbreather configuration shown in Figure 3.28.